Do you have a cool design ready for a swimsuit? Placeit creates amazing clothing mockups that are easy to use, totally customizable and professional. This mockup features a competitive swimmer in a studio. You can even change her swimsuit color! Cool, right? Try out your latest sporty swimsuit design now, it's easy. Did you make an awesome swimsuit design? Show it off with Placeit! We create trendy, professional and functional mockups that are super easy to use! You can even change her suit's color. Cool, right? Try it out! You don't even need to download any expensive software. Create a beautiful visual to promote your swimsuit designs, this image is an excellent choice to showcase to your customers! Use Placeit to get awesome visual assets for your brand. This one features an athletic female swimmer in a studio, you can even change her suit's color. Try it out it's easy. Check out this simple yet powerful mockup featuring a smiling beautiful woman in a bathing suit. This amazing shot is perfect for attracting new customers to your swimsuit brand store. Different colors and designs can be displayed through customization. Try out your swimsuit designs at Placeit! Create a gorgeous image to promote your latest design for a swimsuit with Placeit's mockups, it's an excellent visual that your customers will love due to its simplicity and focus on your design. Start now and make your revenue grow by showing your designs for swimsuits with gorgeous images that your audience will love. Create a gorgeous visual of a woman wearing a swimsuit while at a studio with Placeit and promote your swimsuit designs with an amazing image that your audience will love. Start using this plain studio mockup of a woman wearing a swimsuit from Placeit! 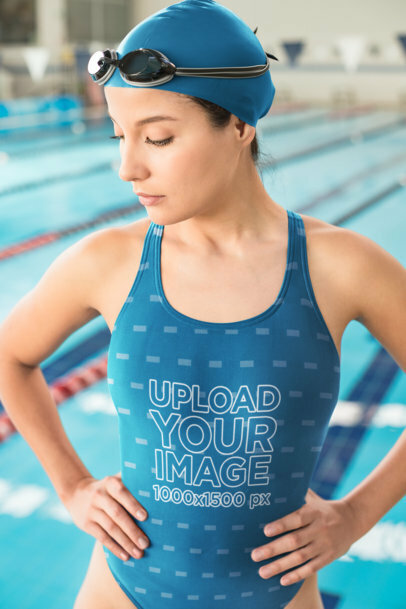 This mockup of a beautiful girl about to swim at a semi-Olympic pool is an excellent choice if you are looking to promote your latest design for a swimsuit. Use a gorgeous photorealistic image that your audience will love and make them fall in love with what you're selling even before they get to have your product in their hands. 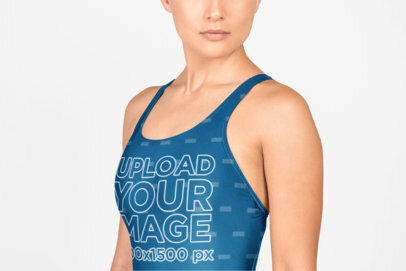 Customize this athletic swimsuit mockup with your design now! Promote your awesome design with Placeit's swimsuit mockups. We create apparel mockups that feature the best locations, models, and settings. Like this mockup featuring an athletic swimmer getting ready to swim some laps. You can even change her swimsuit's color! Try it out, it's easy! Use this mockup of a woman wearing an athletic swimsuit against a flat background to create a stunning image as a part of your marketing strategy within a real context. This swimwear mockup is fully customizable to your liking, you can even change the swim cap color, try it out now and start getting more clicks on your swimwear online store! Just add your sporty swimwear design and that’s it! Check out this mockup featuring a woman posing relaxed wearing a customizable active swimsuit. The semi-Olympic pool and backstroke flags in the background make this picture an ideal marketing visual to display your newest athletic swimsuit designs. At Placeit you can find the perfect mockups to add a professional look to your sports clothing brand, try it now and start getting more customers! Try out this Mockup of an athletic woman in active swimwear posing after some laps to model your great one-piece swimsuit designs. It is fully customizable and you can even change the swim cap color, give it a go and start promoting your women’s swimsuits! Try out this apparel mockup portraying a woman in an active swimsuit to easily advertise your active swimwear ideas. Make this swimsuit mockup part of your marketing campaign and start getting more visitors to your sports clothing brand website! Add your own design now and obtain a professional visual to showcase your athletic swimsuit! Create an awesome swimsuit visual with Placeit's mockups and make your revenue grow by using enticing images that your audience will love. Start now and sell more swimsuits using beautiful images that your customers will appreciate, show them a more realistic visual that shows how your product looks like in real life. Create a gorgeous visual to promote your latest design for swimwear with Placeit's mockups and make your revenue grow by showing your audience a more realistic image that they can feel related to! Start showcasing your cool designs for swimsuits using visually enticing images from Placeit and sell more of your products. Create a gorgeous visual to promote your design for swimsuits, this image is an excellent choice to showcase an amazing swimsuit design to your customers! Start now using Placeit to get awesome visual assets for your brand. Using photorealistic visuals is an excellent way to promote your swimsuit designs to your audience! Promote your swimsuit designs with Placeit. We create mockups that are super easy to use. This mockup features an athletic female swimmer in a pool. You can change her swimsuit color to fit your style. The best part of all, no additional software is needed. Try it out, it's easy! Use this awesome mockup featuring a female swimmer in an aquatic center and start promoting your swimwear designs. Placeit creates mockups that are easy to use and don't require any expensive additional software. You don't even need to hire a graphic designer. You can do it yourself! What are you waiting for? Edit your athletic swimwear mockup now. Did you make an awesome athletic swimsuit design? Show it off with Placeit. Placeit makes amazing apparel mockups perfect for anyone. Like this one featuring a female swimmer in a pool, your design will be front and center and you can even change her suit's color. Cool, right? Edit your Active Swimwear Mockup now. 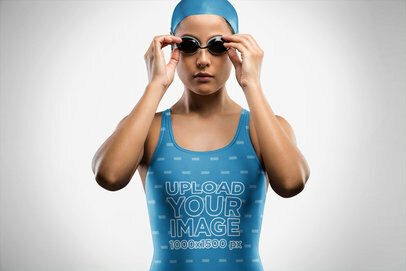 Promote that amazing one-piece swimsuit design in a real context using this beautiful mockup from Placeit. This photo features a beautiful woman in a custom swimsuit entering an Olympic pool. Use this mockup to showcase your latest swimwear line and captivate your target audience right away! Try it out! Are you into Competitive Swimming? Did you make an amazing swimsuit design? Show it off with Placeit! We have a ton of amazing mockups perfect for anyone. This mockup features a competitive female swimmer in a pool. Your design will be the first thing people see and you can even change her suit's color. Cool, right' Try it out, it's easy. Create a gorgeous visual to promote your latest design for a swimsuit and make your revenue grow by showcasing images that your audience will love! Start now using images from Placeit to promote your designs and get your sales to grow by showing a more realistic environment with your latest design for swimsuits. Promote your active swimwear design on Placeit's Swimsuit Mockups! We create mockups that are easy to use, professional, and super eye-catching. Like this one featuring a sporty swimmer adjusting her swimsuit. Your design will be front and center, no one will miss it! Try it out, you can even change her swimsuit's color! Edit your mockup now and take your athletic swimwear line to the next level! Promoting your swimwear design has never been easier with Placeit. We create mockups and templates that are easy for anyone and don't require any additional software. This mockup features a competitive female swimmer in a Pool Center. You can even change her suit's color to match your style. Try it out, it's easy! Create gorgeous visuals for a woman's swimsuit with Placeit! This one is an excellent choice if you are looking to market your latest swimsuit designs using a beautiful visual that your customers will feel related too. Start now making gorgeous images with Placeit and take your brand's visual marketing to the next level! Take a look at this gorgeous girl wearing a swimsuit while posing outdoors, use this visual asset and make your audience engage even more with your brand. You just have to choose a color for her garment using the HEX tool on the right, then drag n' drop your design image file over the upload button on the left. Simple, wasn't it? Try another Swimsuit Mockup! Take a look now at this awesome mockup featuring a beautiful Asian woman wearing a swimsuit while standing against a light-blue wall, it's an excellent choice if you want a gorgeous image to showcase your latest swimsuit design! Use the menu on the right to choose a color for the garment, then drag n' drop your design image file over the upload button on the left. Try another Swimsuit Mockup! Take a look at this awesome visual asset from Placeit, you can use it to promote your latest swimsuit design in a super-easy way! Just use the HEX tool to the right to choose a color for the swimsuit, then drag n' drop your design image file over the upload button on the left. Simple, right? Use a high-quality visual asset and amaze your audience. Try another Swimsuit Mockup! Take a look at this awesome mockup featuring a happy asian girl wearing a swimsuit while standing against a white background holding her hair, it's an excellent visual asset that you can use if you want to promote your latest design for swimsuits in a better way! The HEX tool on the right will let you choose a color for her swimsuit, then drag-and-drop your design image file over the upload button on the left. Try another Swimsuit Mockup! Use now this gorgeous visual asset from Placeit and achieve a better engagement with your audience using high-quality images! This mockup is featuring a beautiful woman wearing a swimsuit while dancing against a white background, you can put your design on her swimsuit with the upload button on the left. Also, change her garment color with the HEX tool to the right. Try another Swimsuit Mockup! 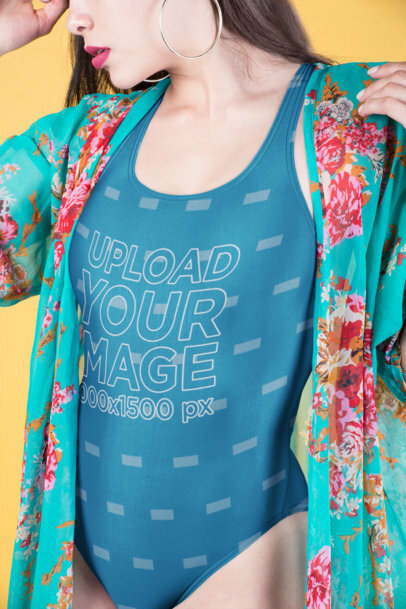 Take a look at this awesome mockup featuring an asian woman wearing a swimsuit and promote your latest design with it! Use the menu on the right to choose a color for it and the one on the left to upload your design. Simple, right? Using compelling visual assets will let you promote your brand in a stronger way! Try another Swimsuit Mockup! Use now this amazing visual asset featuring a girl wearing a swimsuit while posing under the sun, it's a beautiful visual asset that you can use to promote your latest swimsuit designs in a better way! Use the HEX tool on the right to choose a color for the garment, then drag-and-drop your design image file over the upload button on the left. Try another Swimsuit Mockup! Use now this awesome mockup featuring a beautiful asian girl wearing a swimsuit while at a pool and promote your latest designs for swimsuits in a more photorealistic way! You just have to choose a color for the garment with the HEX tool on the right, then drag-and-drop your design image file over the upload button on the left. Try another Swimsuit Mockup! Use now this awesome mockup featuring a gorgeous asian girl wearing a swimsuit while lying on the floor beside a pool, it's a great choice for you to promote your latest swimsuit design in a more photorealistic way! You just have to choose a color for the garment with the HEX tool on the right, then drag-and-drop your design image file over the upload button on the left. Try another Swimsuit Mockup! Use now this awesome mockup featuring a cute girl wearing a swimsuit in a yellow room, it's an excellent choice for you to showcase your latest swimsuit designs in a better way! Just drag-and-drop your design image file over the upload button on the left. Then use the HEX tool on the right to choose a color for the swimsuit. Simple, wasn't it? Try another Swimsuit Mockup! Use now this awesome mockup featuring a closeup of a swimsuit being worn by a woman sitting on a flamingo, it's a great visual asset that you can use to promote your latest swimsuit designs in a more fashionable way! Use the HEX tool on the right to choose a color for the garment, then drag-and-drop your design image file over the upload button on the left. Try another Swimsuit Mockup! Use now this beautiful mockup featuring a woman holding a big inflatable pineapple ring while against a white background, it's an excellent visual asset that you can use if you want to promote your latest design for swimsuits in a better way! Use the HEX tool on the right to choose her garment color, then drag-and-drop your design image file over the upload button on the left. Try another Swimsuit Mockup! Use now this awesome mockup featuring a cropped face woman wearing a swimsuit while holding an inflatable ice cream cone, it's a beautiful visual that you can use to showcase your latest swimsuit design in a better way! Use the HEX tool on the right to choose a color for the garment, then drag-and-drop your design image file over the upload button on the left. Try another Swimsuit Mockup! Use now this awesome mockup featuring a girl wearing a swimsuit and sunglasses while looking at the light, she's against a white background. Use the menu on the right to choose a color for her garment and the upload button to put your design on her garment. Simple, wasn't it? Use Placeit and make your revenue grow with awesome visuals! Try another Swimsuit Mockup! Use now this awesome mockup featuring a closeup of a swimsuit being worn by an asian woman inside a yellow room, it's an excellent visual asset that you can use to promote your latest designs in a better way! Use the HEX tool on the right to choose a color for the garment, then drag-and-drop your design image file over the upload button on the left. Try another Swimsuit Mockup! Take a look at this gorgeous Asian woman walking out of the pool, she's wearing a swimsuit with your design on it. It's great! Oh wait, you can't see it? Well, you just have to choose the swimsuit base color with the HEX tool on the right side of the page and upload your design with the upload button on the left. You can see it now, right? It's so cool! Try another Swimsuit Mockup! Take a look at this gorgeous woman wearing a swimsuit while lying on the floor by the pool, she also has a beautiful outfit to match with any design! Use the menu on the left to upload your swimsuit design, we'll put it in her garment. You can also modify the swimsuit base color using the HEX tool on the right side of the page. Simple, right? Try another Swimsuit Mockup! Use now this awesome mockup featuring a girl wearing a swimsuit while posing and grabbing her hair, it's an excellent visual asset that you can use if you want to promote your swimsuit design in a more beautiful way! Use the menu on the right to choose a color for her garment, then drag-and-drop your design image file over the upload button on the left. Try another Swimsuit Mockup! Take a look at this awesome mockup featuring a woman wearing a swimsuit while moving her hair, she's standing against a white background. It's a perfect choice if you are looking to promote your latest design for swimsuits in a more visually appealing way! Make your design have contrast with this white background and give it a more real sense to it by being worn by the girl. Try another Swimsuit Mockup!